I'm with Mike here. We will hit the track with a different car that the one shown on these renders. I am far from expert in such things, but I agree. It looks too much like last year's (horrible) car. Let's hope that looks can be deceiving and apparently very subtle changes can have a large effect on performance. Somehow the excitement I had been feeling for the new season, what with very promising new drivers and new sources of funding, is fading a bit. I guess we'll just have to wait and see. Perhaps this is why Claire (as well as Paddy, Robert, George, etc.) has been cautioning that a recovery of form and track position will not be immediate. At the first test, Robert drives the car for 2 days (ok) , George, a rookie, drives one day and Latifi drives the other day! What the hell! This is the result of not having enough funds when you drive for Williams! He only has 4 days of driving before season start and he misses one of them so far. too much time is gonna be wasted by changing driver every day at mid day. Don't be too hopeful, based on our last 4 years, this prediction is 100% wrong.We launched renders, we hoped it will be change comes the testing day, we get exactly the same car on track. Though this philosophy can change any day! But who cares? '17 was disappointingly simple but it was fast. Each get 1,5 days. Latifi 1. Latiffi will give invaluable feedback. Man, I'd like to be with you both, but then why release these images with "feast your eyes" and "Get your first look at the FW42!"? What sense does that make? I could imagine Mercedes or Ferrari playing games like that, trying to protect as long as possible some significant innovations from the competition, but I don't see how that is going to help Williams. Have they ever done that sort of thing before? If not, I think we had better start accepting that the team is taking a conservative approach to their recovery effort and not expect any large leaps in design. My wrong, still the same @#$%&! They should get 2 full days each. I agree. I think the team is more concerned with getting the car sorted than with getting George as acclimated as possible. No knock on George, but Latifi has much more experience and thus should be able to give more informed feedback at this stage. I think it's a smart move as an additional half-day of warm-up will mean less to either driver than getting the best possible feedback for setup of the car. I don't see what this could have to do with lack of funding. Latifi is the team's official reserve driver--an employee with a salary--not some hopeful buying his way into a session. The fact that Latifi gets some days of running is absolutely because of funds he brings, zero percent for other reasons so please don't trick yourself guys. She looks simple and basic. Maybe it's still FW41 aero philosophy but without any "addons". And after running basic tests only then highly complex addons will arrive and be tested. Williams did the same thing when Nasr was our reserve driver. 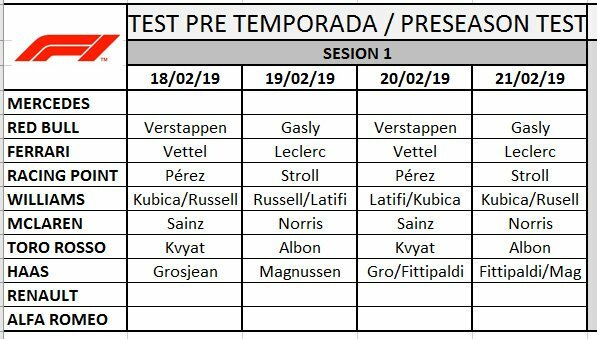 I'm sure both Kubica and Russell will drive the four days on the second test where they will explore car limits. Zero percent? I think you're the one tricking yourself. Every other move made so far by the team coming into this year has not taken the compromises-for-the-sake-funds approach so common last year, so your suggestion that the only reason they might put a more experienced driver in the car for a day's worth during the initial period of testing is for the funding he brings the team is not even credible, much less self-evident. Edited 1 time(s). Last edit at 15/02/2019 19:26 by shriekback. Keep is simple & fly through the air. A).I know a guy who plays violins for almost 70yrs and he still plays it awful! The quality of experience has nothing to do with numbers. If George with less experience can transfer it more into resaults, there's more value in it than Latifi's more experience. .George & Robert should drive the races.They are both rookies so even full 8days of testing is not enough for them.Any minute lost, directly affects our race weekend. C).Sofina pays us to allow Latifi drive some days.That's exactly the meaning of going for financial-based decisions.If you want to ignore the connection between the money he brings and his driving, and bring in a reason like "his experience is the reason he gets that drive", it's like believing Mclaren-BAT partnership has nothing to do with tobacco ads. D).There hasn't been any evidence that a driver's input can make the car a better one.We have millions of examples to ignore this thing...What a driver can gain with more time in the car will help more than the input he can bring on its development process...What did Robert bring us last year? He was way more experienced, did more laps, helped nothing at all. Our car had a massive cooling problem and was unable to run with maximum engine setting. Our car didn't have a carbon gearbox and suffered from a lack of rear-end stiffness. I suppose it did. Car will now benefit from better weight distribution as well. Our car had a correlation problem from the wind tunnel to track due in no small part to wind tunnel surface function. Last years car probably had even greater problems that were not apparent at a surface look. If they understood and solved cars problems from 2018.. then it should at least be driveable. And if our drivers are able to translate car behaviour on track to race engineers and design team in the garage.. we should get the best of this package soon enough and then start piling on performance if they have it planned. I remember some or lots of people commenting on last years RedBull season start, with a clean and simple design. Now that Williams has gone down the simple but probably quite upgradeable route.. all is wrong. And to top it all.. drivers should make that little bit more difference in the end. At least from what we saw displayed during Fridays last season. Call me whatever you want.. I'm still optimistic this is an optimal solution to start fresh. As long as this car can manage tire temps better than last years car did. We will have made a huge step that will translate into performance and move Williams up the grid. Couple of things computer graphics will not show you all the detail just the basic shape. So I am still keen to see the car in the flesh so to speak. Also my view of the design is one of Williams can't afford to take risks this year. They need to come up with a design that fixes the 2018 issues as well as adopting the 2019 changes which hopefully in turn will see a faster car. Williams just doesn't have the budget and as such the resources of the Mercedes or Red Bull's so if you expect the FW42 to be anywhere near them in terms of all the finer details you are most likely going to be disappointed. It frustrates me that the way some commentators go on about how this car is better than that well that would be fine if they all had budgets of the same level but as things stand this is not going to happen in F1 anytime soon. So teams like Williams are always going to be that one step away from the big budget teams. I look back to 2018 where Mercedes brought updates to just about every race. Can Williams match that not likely. As for the drivers at testing don't forget that Russell has had quite a bit more experience in F1 than some of you seem to think he has given his testing with Mercedes. As for Latifi if he brings part of the budget for the team well the commercial realities will see him in the car at some time. So just get over it. At least I am confident that with all the new sponsors coming on board the Williams budget for in season development will be far better than past years. Anyway just a few days before we start to, in some small way, find out some of the answers to things like have we got a quicker car. Time will tell.